When Moreton Bay's first free settlers arrived, they settled in an area that they called Zion's Hill. The settlement was a mission station, established to bring Christianity to the indigenous population, and those first settlers were German. The settlement became known as German Station and is now Nundah. Zion's Hill was located near where the large Centro Toombul shopping mall now stands. The mission was placed on a gentle hill above a small river that they named Kedron Brook, apparently a reference to a place from the Bible called Kidron or Cedron, a brook near Jerusalem. 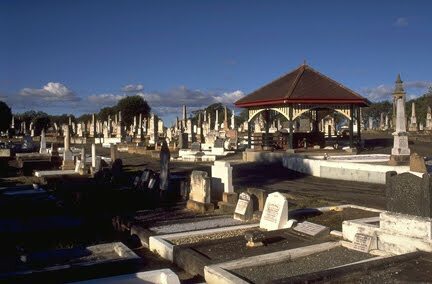 The graveyard that they initiated near their little settlement was later surveyed and became the Nundah Cemetery. Here is my recent photo, tweaked a little to give somewhat of an old world feel. It is thought that the first burial here occurred in 1845, and it officially became a cemetery reserve in 1862. The oldest remaining headstone is from 1855. The nearby mission petered out by 1850, but the German Station Cemetery remained in use, administered by trustees. The Brisbane City Council took over the running of the cemetery in 1930. The photo above was taken in 1996, and it shows the somewhat jumbled and crowded nature of the graves. The pavilion in the photograph was built in 1914 and restored in the 1980s. The cemetery was closed in 1963. Wow! I never even knew that was there. There are a couple of little cemeteries tucked away in the (old) Pine Rivers Shire. They are fascinating places and tell a lot about the history of the area. I particularly love gympie cemetery as it tells of its mining history and large Irish immigrant population. Thanks for the post! Fascinating as always! Yes, I love historical cemeteries as well. They tell us as much about the surrounding community (at the time it was opened) as do newspaper clippings, and the headstones last longer. I went on a guided tour of the Chinese cemetery in the Ballarat goldfields last year and loved the experience. Agreed. Cemeteries are a valuable resource, providing a link to the people and customs of the past. Another great post Trev! Thanks for keeping this up. You have created a marvellous local history resource.